One of the biggest manga festivals in Europe, Angouleme International Manga Festival is held in Angouleme, a cit located in western France, every year. The festival, which began in 1974, celebrateed the 45th anniversary in 2018 as the oldest manga event in Europe. Tezuka himself visited the festival in 1982. During the festival period, various events are held through the city to introduce excellent manga works from all over the world. In 2018, the festival held the exhibition: OSAMU TEZUKA MANGA NO KAMIAMA, featuring Osamu Tezuka. The exhibition was well-received among a lot of visitors in France, and was decided to be toured to Japan. At TOMM, the exhibition was held through the 75th and 76th exhibition period, presenting the exhibits with the least changes to the content planned by the French curator, which gives us new attractions of Tezuka through the view point of non-Japanese curator. 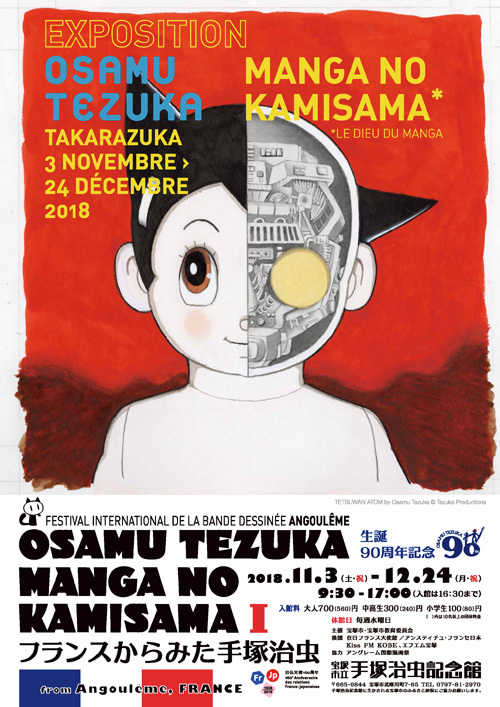 The 75th exhibition introduces the 1st, 2nd and 3rd part of the exhibition: OSAMU TEZUKA MANGA NO KAMISAMA held in Angouleme, consisting of a total of 5 parts.